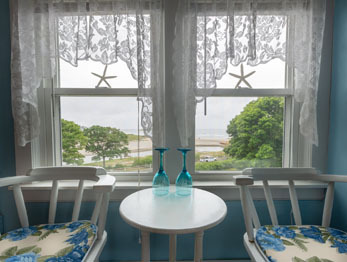 The Blue Shutters Beachside Inn –offers a variety of uniquely decorated rooms and apartments, all but three offer breathtaking views of Good Harbor Beach. 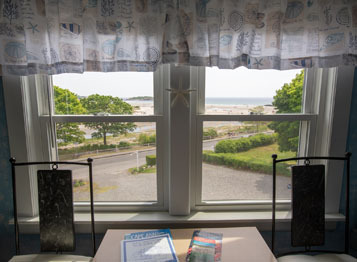 All guests have access to the Main Room and the grounds of the Blue Shutters -- both facing Good Harbor Beach. 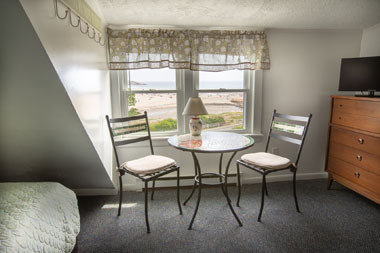 In addition, continental breakfast is available to our guests all year long. 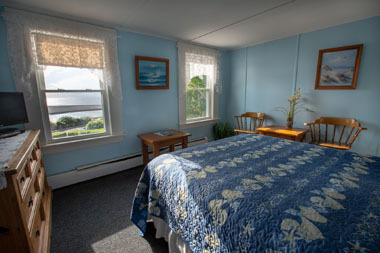 Rates for guest rooms are based on one- or two-person occupancy. 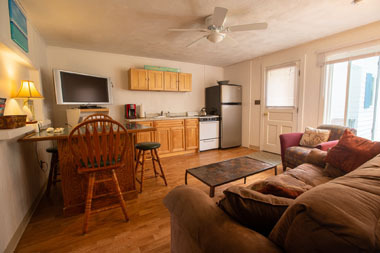 Rates for our apartments are based on four-person occupancy. There is a charge of $25 per person for additional guests. Located on the first floor, just off the Main Room, Fireside features a king-size bed and a sofa bed, a large stone fireplace and a private in-suite bath. This two-bedroom apartment on the first floor features a queen bed and two twins, 1.5 bathrooms, a full kitchen in the living-dining room area, and a private deck opening onto the back lawn. Located on the second floor, this room features a king-size bed, a kitchenette and a private in-suite bath. 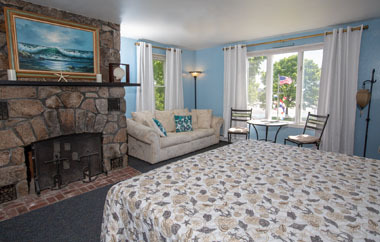 Located on the second floor, this room features two twin beds and a large private bathroom. 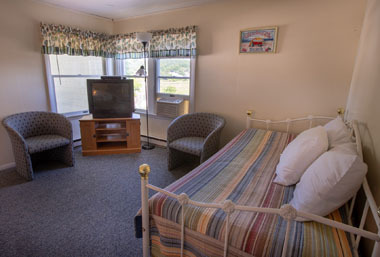 Located on the second floor, this room features a queen-size bed and a large private bathroom. 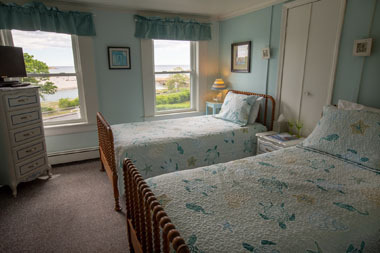 Located on the second floor, this room features a queen bed and a shared bath. 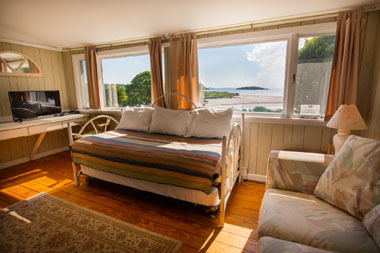 Located on the second floor, this one-bedroom apartment features a king-size bed, a galley kitchen, a large private bath and a trundle bed (sleeps 1 or 2) in a separate living/dining room area overlooking the beach. 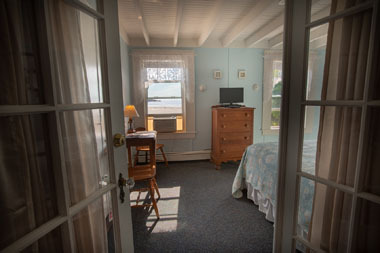 Located on the second floor, these identical one-bedroom apartments each sleeps four and features a queen bed, full kitchen and bath, and a dining/living room area with a trundle bed (sleeps 1 or 2), as well as water views from a spacious back porch. Located on the third floor, this room features a queen bed and a trundle bed that sleeps 1 or 2, and a private in-suite bathroom. Located on the third floor, this room features a queen bed and a private in-suite bath. 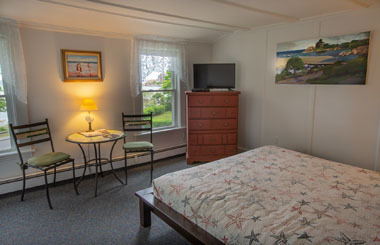 Located on the third floor, this room features a queen bed and a shared bath. For guests staying 3 or more nights, we require a deposit of one half of the total payment in advance in order to reserve your room. For guests staying 1 or 2 nights, we require payment in full in advance in order to reserve your room. For those reservations cancelled 14 days or more in advance, your deposit will be refunded, minus a handling charge. For those reservations cancelled less than 14 days in advance, your deposit will be refunded -- minus a handling charge -- only if we are able to fill the room (handling charge is $25 for reservations under a week; $50 for reservations of a week or more).